Anger among West UP's sugarcane farmers has repeatedly been highlighted as a huge cause of resentment among the locals against the BJP, both at Centre and in the state. BSP supremo Mayawati with SP chief Akhilesh Yadav at a joint rally in Deoband. Minutes before Mayawati, Akhilesh Yadav and Ajit Singh are to take the centrestage, the emcee on the stage trying to bind thousands of restless party workers from the three different parties issues a slogan, "Sapa, Basapa ki jai." He stutters and then corrects himself again, "Basapa, Sapa aur Ralod ki jai." He rearranges the party names in following slogans, trying to find the perfect rhythm. The emcee's plight was understandable given that this was the first time ever that chiefs of three regional heavyweights — Samajwadi Party, Bahujan Samaj Party and Rashtriya Lok Dal — who have spent the better part of last three decades fighting each other, were sharing stage for a united political campaign. It was 26 years ago when the then SP chief Mulayam Singh Yadav and the then BSP chief Kanshi Ram came together to defeat BJP at the peak of the Ram Temple movement. But the alliance broke down soon after never to be revived again, until today. Call it political expediency, given BJP's menacingly successful strategy of Hindu mobilisation and signs of a national resurgence for the Congress, or describe it as plain desperation. The three leaders stood shoulder-to-shoulder under a giant marquee, as did lakhs of their cadre, in Deoband on Sunday to stake their bid for the Prime Minister's chair. 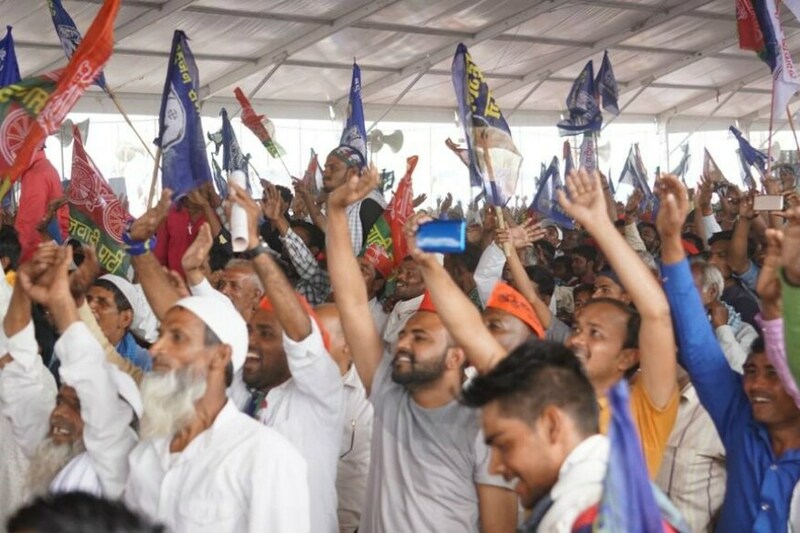 "If we form a government, we will not just give Rs 6,000 but also provide stable employment to every household," Mayawati, attacking Congress' Nyay scheme, said in her speech to a huge cheer from the audience. "They [BJP] call us milawati gathbandhan...they are drunk on power. This gathbandhan is not milawat, this is for mahaparivartan. This is gathbandhan for electing a new prime minister," SP chief Akhilesh Yadav declared from stage to a huge applause. Lakhs of loyalists of the three parties, including Jats, Yadavs, Jatavs and Muslims, turned up for the event and depending on whom one spoke to, one of those three leaders on stage was going to be India's Prime Minister in a month-and-a-half from now. "You remember the old slogan 'Mile Mulayam Kanshi Ram hawa mein ud gaye Jai Shri Ram'?" Ajay Chowdhary, a Jat from a nearby village Kausepur rhetorically asks, referring to the slogan floated at the time of Mulayam-Kanshi Ram alliance. "That is what is going to happen now. BJP is trying to polarise Hindus but it won't work now," he adds. "In 2014, the BJP asked us to become Hindus, now they're asking us to become nationalists. What happened to all those promises? What happened to our pending payments for our sugarcane produce? We have only been paid for 20 days out of last five months. How will we run our households like this?" another Jat Neeraj Chowdhary asks. Both are RLD supporters. Anger among West UP's sugarcane farmers has repeatedly been highlighted as a huge cause of resentment among the locals against the BJP, both at Centre and in the state. Farmers, both Hindus and Muslims, complain about rising prices of fertilisers, diesel and electricity, while suffering from non-payment for their sugarcane produce. Both Mayawati and Akhilesh Yadav spoke on this issue in their speeches. "Farmers here sow sugarcane and sweeten the entire nation. But BJP doesn't care about you. Mayawati ji acted against mill owners, we acted against mill owners. But the BJP has done nothing," Akhilesh Yadav said. Mayawati promised to jail private mill owners who haven't settled the pending dues of farmers, after coming to power. Both the statements drew immense applause. Around Rs 10,000 crore of dues to sugarcane farmers reportedly remain unsettled with elections round the corner. The other overarching theme in the elections is of unemployment. While Neeraj Chowdhary, Ajay Chowdhary and four other Jats are in the middle of sharing their farm-related woes, Deepak Kumar, a Dalit, walks right in the middle and talks about "Bukhmari" and "Berozgaari". His confidence to interrupt a conversation of Jats is an interesting social phenomenon that could perhaps only happen at such a unique political event. "I'm a BSc graduate and I'm unemployed," Deepak says and brings his friend, a fellow Dalit, Sachin Kumar, in too, "He just finished his ITI diploma and he works as a labourer at a construction site. That is what is wrong today," he says. "And on top of it, Modi tampered with SC/ST Act, they tampered with the roster system, that's why we are jobless," Sachin adds. If Dalits are so angry with BJP, why did a section from within them vote for BJP repeatedly in 2014 Lok Sabha polls and 2017 UP assembly polls? "We wanted a strong opposition to Mayawati. BSP ki takkar chahiye thi. But BJP did not fulfill its promises. Modi ne kaha main gareeb ka ladka hun. But we are under more debt now than we were in five or two years ago. That's why we're returning," said a Jatav attendee who did not wish to be identified. "Against BJP's 56 alliances stand just three and look how he's panicking already," said an SP supporter. In 2014, BJP's Raghav Lakhanpal defeated Congress' Imran Masood by nearly 70,000 votes. Both of them were expected in a much closer face-off this time. Until BSP-SP-RLD announced their joint candidate Haji Fazlur Rehman. Muslims and Dalits make up a substantial electorate of not just Sahranpur but the entire West UP, eight of whose seats are going to polls in four days from now. The opinion of Muslims, which are nearly 42% of the local population, is particularly decisive. And it may not be going in Congress' favour this time. "We have nothing against the Congress. The thing is that the Mahagathbandhan has already pitched good candidates, with the support of Dalits and Jats, so practically nothing much remains for the Congress. Most of the Muslims not just in West UP but in entire UP have agreed that voting for Congress is akin to wasting your vote. Since MGB looks the most formidable against BJP, that's where we're going," said Mohd Tassavur. It is perhaps with this in mind that Mayawati made repeated pleas to Muslims to not vote for Congress. "I want to make an open appeal. It's not the Congress but the alliance which is fighting the BJP. Congress wants to ensure the alliance does not win. Congress is trying to help the BJP in this election,” she said while sharing the stage with Akhilesh Yadav and RLD chief Ajit Singh. With just three days left for the end of campaigning for phase 1, Mahagathbandhan's show of strength on Sunday may be the final big political event of West UP, although individual leaders like Akhilesh Yadav will continue holding their rallies. But will this show of unity be enough to see their candidates through? Soon we may find out.